FILE - This July 14, 2018, file photo shows the building of the Main Directorate of the General Staff of the Armed Forces of Russia, also know as Russian military intelligence service in Moscow, Russia. Defense and security officials worry that as part of Moscow's plan to sow division and discord, it is trying to conquer the U.S. military — not with bullets or missiles but with tweets and memes. In the case of the U.S. military, according to current and former U.S. and Western officials, the Kremlin's aim is likely to establish what is known as reflexive control. 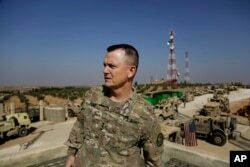 By seeding U.S. troops with the right type of disinformation, they say, Russia can predispose them to make choices or decisions that are favorable for Moscow. Officials and experts say Russia's use of influence operations to target the U.S. armed forces should come as no surprise. 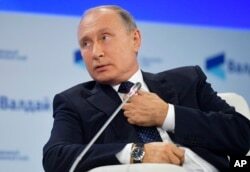 Russian President Vladimir Putin has tested the approach, using social media especially, in places like Ukraine, and since then it has become an ever more critical part of Russia's overarching strategy. "There's nothing new with Russia or the Soviet Union wanting to have that degree of influence," Lt. Gen. Robert Ashley, director of the Defense Intelligence Agency, told an audience at the Center for Strategic and International Studies in September. "This is really kind of something that is in Putin's DNA as a former KGB agent." 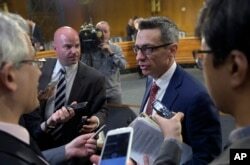 "U.S. military personnel and veterans — it is the uncovered stone in the Russian influence effort that no one is really taking enough of an interest in," said Clint Watts, a former FBI special agent and now a senior fellow at George Washington University's Center for Cyber and Homeland Security. Democratic presidential nominee Hillary Clinton speaks at a campaign rally in Pittsburgh, Pennsylvania, and Republican presidential nominee Donald Trump gestures as he arrives for a campaign rally in Raleigh, North Carolina, Nov. 7, 2016. "Whether that's Facebook, Twitter and others, we're seeing where it [Russia] is focusing on identifying affinity groups," said Heather Conley, a former deputy assistant secretary of state during the administration of U.S. President George W. Bush. 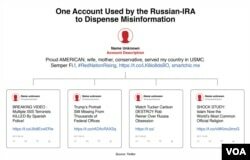 In Twitter's latest release of accounts linked to Russia's Internet Research Agency (on Oct. 17), at least 39 had user descriptions promoting links to the military. 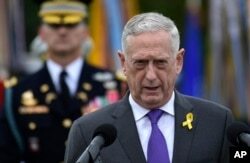 "We certainly are still seeing a lot of the accounts that we're looking at that continue to have what seemed to be clear military connections," Bret Schafer, a social media analyst for the German Marshall Fund of the United States' Alliance for Securing Democracy, told VOA. "My guess is a lot of this probably would be happening more in closed Facebook groups in which there are many with the military, and frankly, nobody has any idea what's really happening for those groups, because of course Facebook doesn't share those with researchers," he said. "Our personnel get guidance and instruction regarding misinformation and information security as part of their pre-deployment training and their arrival process in order to increase their resilience," according to Maj. Mark Peebles with NATO's Task Force Latvia Headquarters.